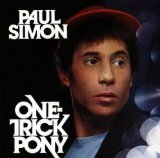 One-Trick Pony (this album) (1980), Negotiations And Love Songs 1971-1986 (compilation) (1988), Anthology (compilation) (1993), Paul Simon's Concert In The Park (1991), Paul Simon 1964/1993 (compilation) (1993), The Essential Paul Simon (compilation) (2007). Showing latest 5 ratings for this track. | Show all 27 ratings for this track. Related links: top tracks by Paul Simontop tracks of the 1980s, top tracks of 1980. The best track on the album. The only true Simon classic on the LP and a hint of the more world music style to come on, Graceland, and, rythym of the saints. Great track. Simon is at his best when playing in a foreign rhythym. This song is no exception...easily the highlight of this album.